Lakshmi is the Goddess of abundance and prosperity. She is invoked during significant Hindu rituals and her energies are considered highly auspicious. Her energy is powerful yet softly feminine and this is one reason many women have a special affinity for Lakshmi. She helps bring love and grace into our homes and our lives. My association with this beautiful Goddess began right at the time of my birth. I was named ‘Haripriya’ which is another name of Goddess Lakshmi. My grandmother shared a special bond with Lakshmi and during my childhood I witnessed the prayers and rituals that she performed to connect with Lakshmi energy. After the passing of my grandmother, I did not consciously connect with Lakshmi for very many years. However, the Lakshmi energy made its way back into my life some years ago. It sent me frequent signs urging me to connect with it and I was soon inspired to connect with Lakshmi all over again. I now work regularly with the sacred energy of Lakshmi and I hope that you will be inspired to invite her energies into your life as well. What can Lakshmi help you with? Abundance and Prosperity– Lakshmi can help you create abundance in your life. This is not restricted to money but includes abundance in every aspect of life. Manifestation of Desires– Lakshmi can help you manifest all those desires that are for your highest good. She can also help you with service oriented desires that will help the world at large. Professional Reiki Practice– Lakshmi can help you create a successful Reiki practice by helping you attract an abundance of clients/students that are right for you, while also helping you create financial abundance by doing the Reiki work that you so love to do! Feminine Strength– Lakshmi can help women tap into the feminine aspect of their energy and to discover the joy, power and strength that come from being a woman. Chanting– If you have never worked with Lakshmi before, chanting the name ‘Lakshmi’ is one of the easiest ways to begin connecting with her energy. Chanting the names of the Ascended Masters is one of the most effective ways to connect with their energies. Chant the name ‘Lakshmi’ whenever you feel like and then allow the energy to guide you as you need it. Pictures– Have a picture/painting of Lakshmi in your altar/ healing space/ living room or any other space that feels right to you. Every few days, stand before the picture and draw the Reiki symbols in the air. As you do this, intend to connect Lakshmi energy with your Reiki practice. Reiki Box– To manifest abundance in your life place a picture of Lakshmi along with the intention slips in your Reiki box/ Money Bank. Alternately, write the name Lakshmi on a piece of paper and put that in your Reiki box/ Money Bank. Pink Lotus Flowers– Lakshmi energy is associated with the pink lotus flower. 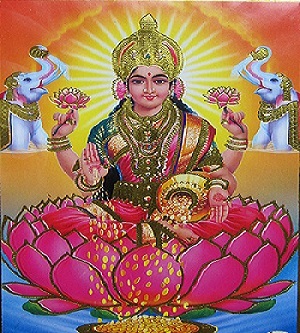 Have pink lotus flowers in your home, light a lamp/candle and invite the Lakshmi energy into your home. Or meditate in a natural space that has pink lotus flowers in bloom and request Lakshmi to shine her energies into your life. Enjoy working with the pure and powerful energies of this graceful Goddess! Thank you. I have just thought to bring Lakshmi into my life.